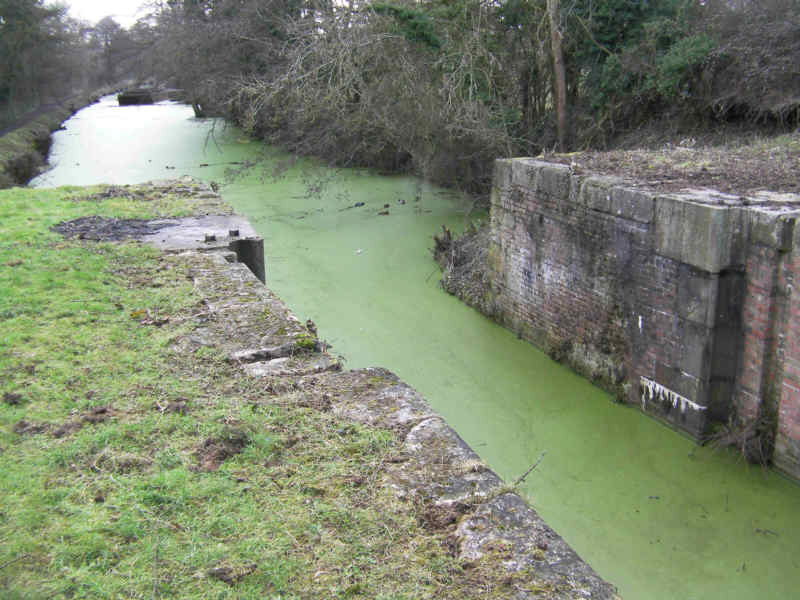 This is the length of canal presents an interesting challenge for those with robust small craft wishing for a bit of adventure without the need for portaging. Be advised that Bonds Mill Bridge has a very low headroom ( see previous section ) when down. 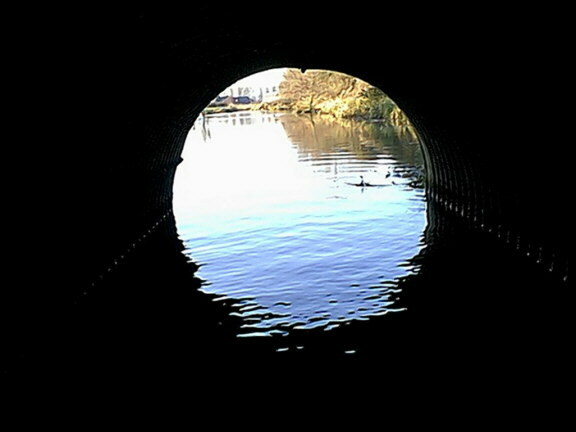 It is only possible for light craft to pass through the railway culvert at the Ocean. The base of the culvert is covered in rubble and stones and care should be taken not to damage boats particularly at the eastern (upstream) side of the culvert. Wellington boots and careful man handling past this obstruction is advised. The Ocean Railway Bridge was infilled after the canal was closed and represents one of the biggest obstacles to restoration on the Stroudwater. Beyond the railway is the Ocean, so named because the canal widen out here into a large pool, and on the far side is Ocean Swing Bridge (currently fixed). 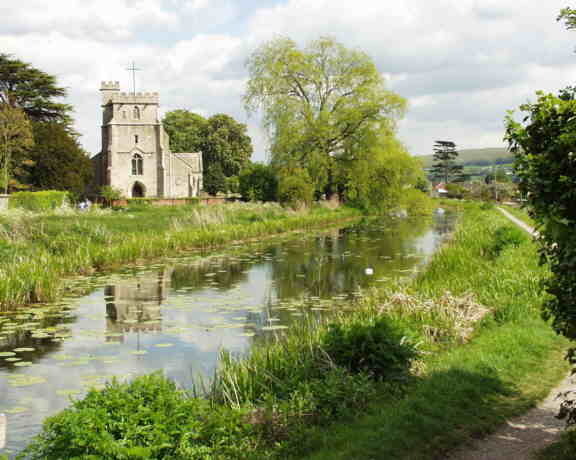 The next stretch is one of the most beautiful and most photographed on the Stroudwater as the canal swings past St Cyr's church. Part of the graveyard was relocated when the canal was built. Nutshell Bridge is another original Stroudwater brick arched bridge and is unusual in that it forms part of two other buildings, Nutshell Cottage (west) and Nutshell House (east). The two are linked by a tunnel under the road. Nutshell Cottage has always been just a dwelling but Nutshell House has also served as a warehouse and traces of loading openings can still be seen. No evidence has been found to link these directly with the canal company and it is likely that they were built to serve the nearby Stanley Mill (Grade 1 Listed). 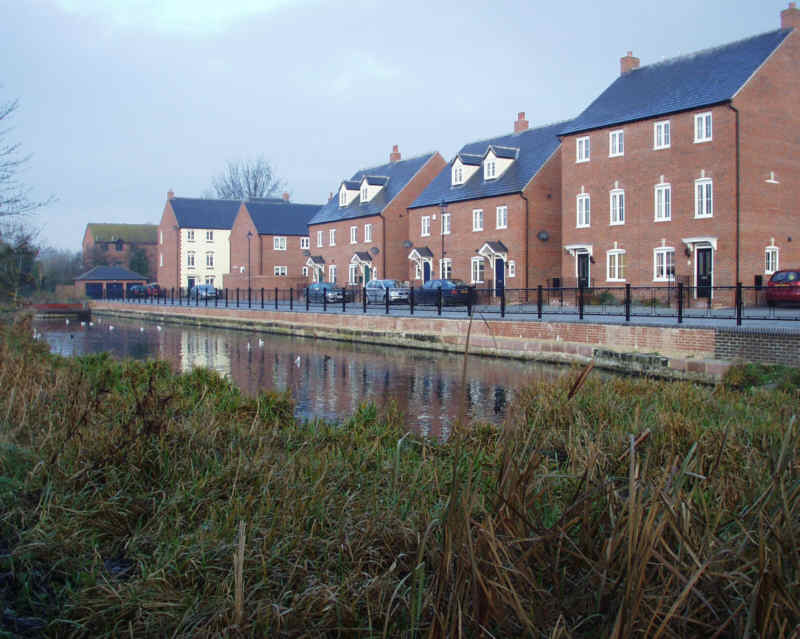 The canal passes through housing on both sides before reaching Stonehouse Wharf, now being redeveloped, and the new Dowton Road Bridge which was built recently to replace a culverted crossing. This is the closest point to Stonehouse. A short stretch now leads to Upper Mill Bridge, another fixed swing bridge, but watch out for girders underneath. This bridge is likely to be replaced by a new fixed bridge during the course of 2010. 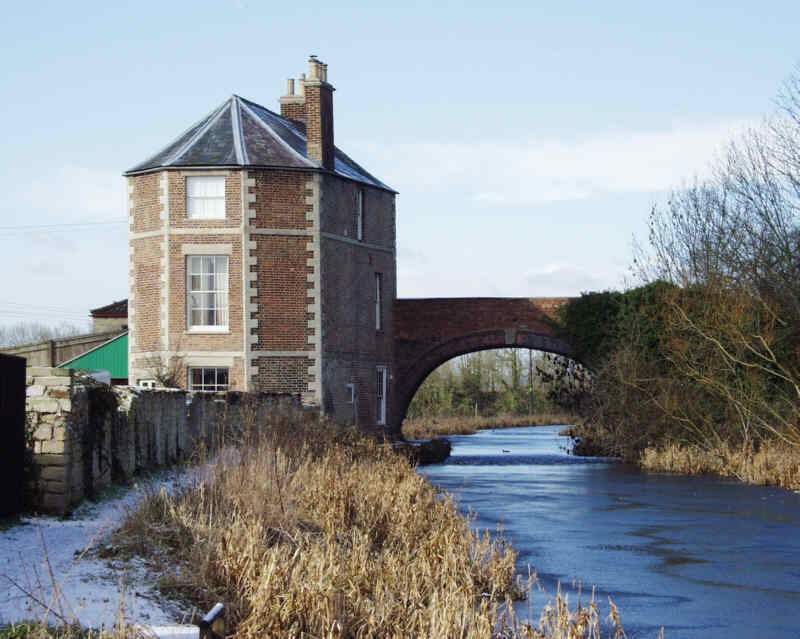 Wycliffe School Boathouse still survives on the offside; when the canal was open, the pupils used this length of canal for rowing practice. The canal is crossed by an iron bridge which used to carry the Midland Railway Stonehouse - Nailsworth line; this is now a cycle trail. The unusual design of the bridge was the result of persistent construction problems due to the poor state of the ground on the offside of the canal; a problem that severely tested the finance of those building it. Beyond the railway is Haywards Bridge which carries the Ebly Bypass. 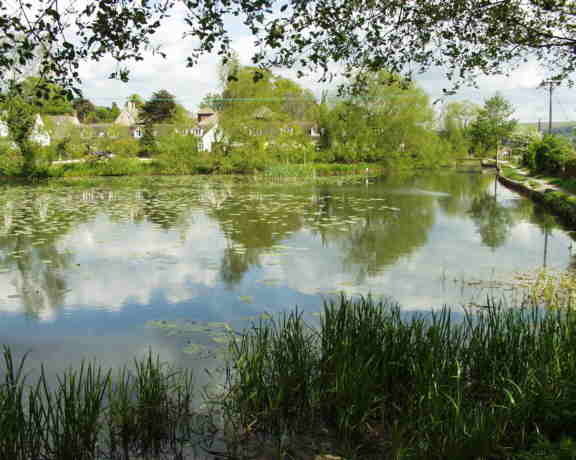 The canal then passes a row of cottages on the towpath side and a pair of coal pens before reaching Ryeford Bridge which has been widened significantly over its long life. Beyond the bridge the small wharf, the surrounding buildings and Ryeford Swing Bridge (restored but small boats can pass underneath) present an attractive sight. The canal now runs parallel with the River Frome, from which it draws its supply, with the towpath forming a narrow strip between the two. Ryeford Double Lock marks the end of this section of the canal - at least for the present time. The offside wall of the upper chamber collapsed following a major water main burst a few years ago and has been rebuilt. The rest of the lock has been partially restored and some original paddle gear remains in situ.